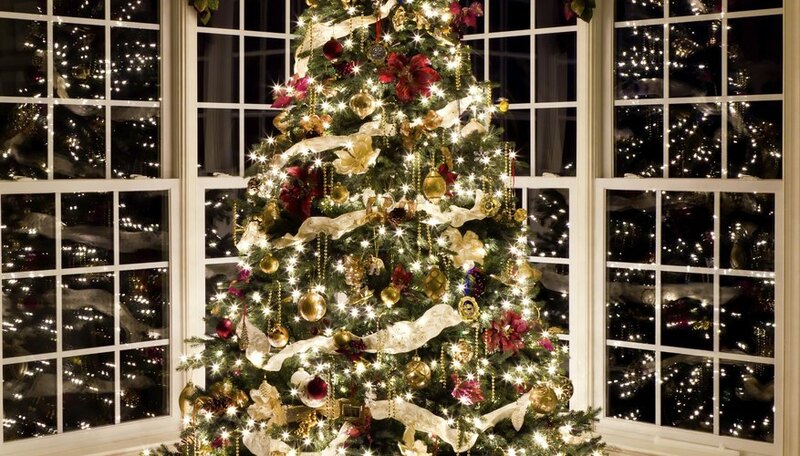 Christmas tree toppers often become the main attraction in a well-decorated home. They can be as complex and ornamental as you'd like, but there is also beauty in simplicity. Best of all, you can make your own creative tree toppers for a personalized touch to your holiday tree trimmings. Tie a bow. Patterned and metallic or solid and velvety, ribbon gives a rich, lush look to holiday decor. Tie a large multi-looped bow -- wired ribbon is perfect for this type of project. Once your bow is complete, set it atop the tree, letting curled waves of ribbon cascade down the trees sides. With ribbon, you can make your tree topper perfectly match the colors and theme of your tree's decorations. Branch out. Collect small branches and twigs and cut them into pieces that are 6 inches or less. Using a hot glue gun, connect the twigs to fashion a rustic star. It can be simple and streamlined with minimal branches, or busier when you include more twigs. Fasten the finished star to the tree using wire, or cut down a paper towel or toilet paper cardboard center piece, glue it to the back of the star and affix the cardboard cylinder over a top vertical tree branch. Make a topper from holiday treats. Bake or buy Christmas cookies in different shapes and textures. Once baked and cooled, coat cookies with acrylic or varnish and let dry. Fasten cookies and cellophane-wrapped hard candies to a cone-shaped plastic tree topper by using glue. Set your sweet topper on the tallest bough. Make it easy, but different, with a hat. Place a traditional red-and-white Santa hat on top of your tree. Arrange the tree's branches around the hat so the hat sits at the angle you most like it. Fasten the Santa hat with wires or ornament hooks so the topper is secure. Turn an ornament upside down. Some of your favorite ornaments can become toppers themselves. Simply take the hook and end-cap -- if there is one -- off of your ornament to expose an open end. If large enough, turn the ornament upside down and insert the topmost vertical branch into the ornament. Assess its sturdiness; it may be fine alone, or, you may need to attach wire for added support.